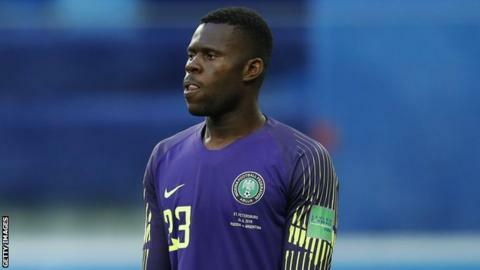 Anorthosis Famagusta have confirmed they will appeal against a nine-point deduction imposed by the Cyprus Football Association (CFA) for fielding Nigeria goalkeeper Francis Uzoho earlier this month. The CFA punished Anorthosis after it upheld an appeal by Apollon Limassol, who had disputed that debutant Uzoho played with an invalid health certificate in a game between the two sides. Anorthosis, who had won the fixture 1-0, saw that result overturned in favour of Apollon and had an additional six points deducted for breaking the rules. Uzoho, 20, was also handed a one-match suspension and a fine of €1,000 euros ($1,130), which means he is set to miss the final match of the Cypriot regular season. He has already sat out two matches since his disputed debut. But, in a statement on the Anorthosis website, the club said it will ask the CFA to postpone its final regular league game while an appeal is lodged. The overall deduction of nine points has seen the club drop into the bottom half of the 12-team league, which sees six clubs play each other twice more to decide who is relegated. That leaves the top six clubs to complete their seasons against each other to decide the Cypriot champions. Uzoho and his representatives have declined to comment on the situation. Nigeria's first choice goalkeeper Uzoho joined the Cypriot giants on loan from Spanish side Deportivo La Coruna on deadline day, in search of top-flight football ahead of the 2019 Africa Cup of Nations. Capped 12 times by Nigeria, he played all three matches as the Super Eagles exited the 2018 World Cup in the group stage. In October 2017, Uzoho became the youngest foreign goalkeeper to ever play in La Liga and marked a memorable Deportivo La Coruna debut with a clean sheet. Uzoho was part of the victorious Nigeria squad at the 2013 Under-17 World Cup in the United Arab Emirates, albeit without playing a single minute at the tournament. He only arrived at Deportivo from Qatar's Aspire Academy in January 2017.